Johnny Mackintosh goes into Space! It’s happened sooner than I thought. 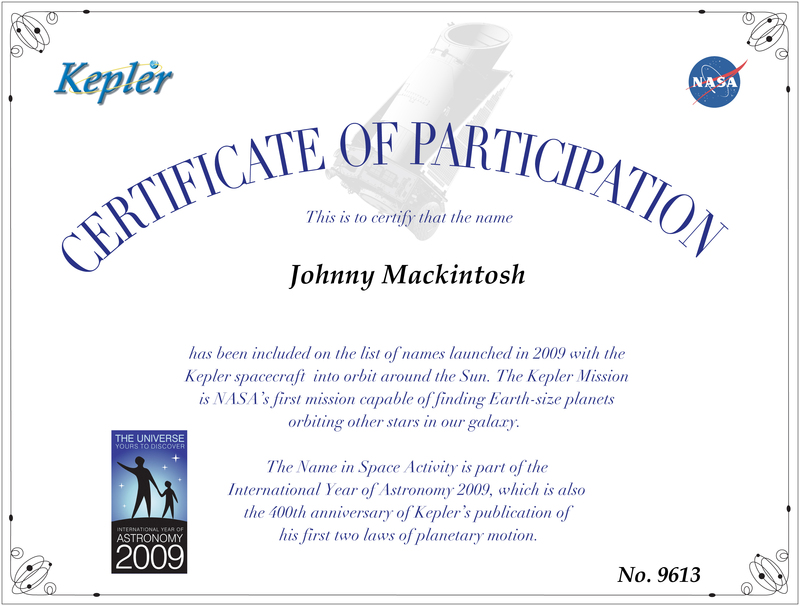 Even if I do become an astronaut, Johnny Mackintosh is going to beat me by leaving the Earth first. His name is now included on the DVD that NASA is sending up with the Kepler Mission, the first space probe that should be able to detect Earth-sized planets beyond our solar system. 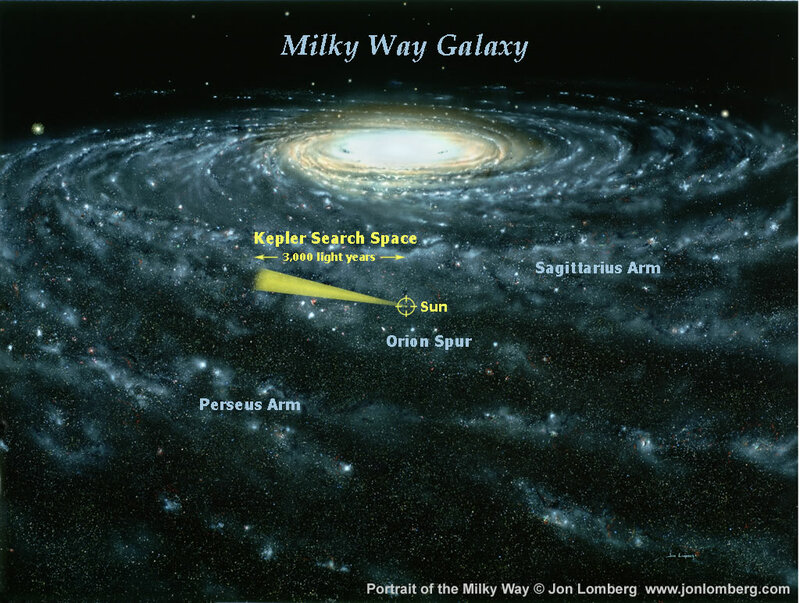 Kepler will orbit the Sun, simultaneously observing 100,000 nearby stars within a fairly narrow search beam (as shown in Jon Lomberg‘s illustration). Were it to orbit Earth, we’d sometimes be in the way. If a planet crosses the disk of one of the stars observed, the amount of light reaching Kepler from that star will marginally reduce. But for us to observe that happening, the plane of the planet’s orbit must match our line of sight. All things being equal, the chances of that (for a planet about the same size as Earth orbiting at roughly the same distance) turn out to be about 0.47% (which is 1 in 210). By dividing 100,000 by 210, this means we’d expect to observe around 480 Earth-like planets if there’s one around every star. Wow! Here’s an animation from artist Donald Grahame showing Kepler in action, from it leaving Earth until it detects a planet, say 1000 light years away. There are more animations to view on the Kepler site. Why not send your own name into space? The deadline is 1 November 2008 but there’s no time like the present. The Mission itself is due to launch in February 2009. As well as giving your name, there’s the chance to leave a message about the Kepler Mission. Perhaps, once entries close, you’ll all be able to read what Johnny’s written? Imagine, in the far future, if a spaceship on a reconnaissance mission find a large telescope orbiting an ordinary star in an average solar system. They might salvage it and discover a disk onboard that uses optical storage technology. And when their scientists open the disk, they will find all our names – the far-sighted humans who wanted to look for sister planets across the Galaxy. ~ by keithmansfield on May 20, 2008.